Effective September 1, 2016, Cove Property Management will begin the transition to make all of our properties smoke-free environments, including apartments and common areas. All new residents and residents renewing their current lease will be required to adhere to a newly adopted smoke free policy. Resident are not allowed to carry or smoke a lit tobacco or marijuana product or inhale vapors from, or otherwise allow vapors to be emitted from, an electronic smoking device in the Premises, on any balcony or patio, in any interior common area within any building within the rental community or within twenty-five (25) feet of the exterior of any building within the rental community. We are dedicated to provide a safe environment for our employees, residents and guests as well as preserve the quality of our apartments. The decision to go smoke-free has been a result of many reasons including current resident complaints, a shift in the tolerance of smoke and second hand smoke and possible loosening of Marijuana laws. In today’s world, smoke and the odors of smoking are increasingly becoming an issue we must deal with as an industry. 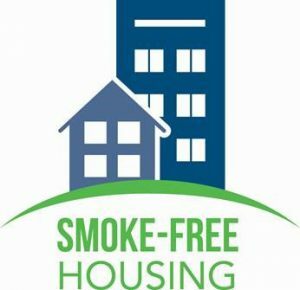 We have created the following logo to help promote our efforts to provide Smoke-Free Housing and will begin to see this on our website and print materials.